U.S. President Donald Trump’s administration has reportedly weighed additional military action in Syria in response to dictator Bashar al-Assad’s continued use of chemical weapons. The president discussed potential actions early last week at a White House meeting that included Chief of Staff John F. Kelly, national security adviser H.R. McMaster and Defense Secretary Jim Mattis, officials said. One official, who like others spoke on the condition of anonymity to address internal deliberations, said that the president did not endorse any military action and that officials decided to continue monitoring the situation. The Post acknowledges that the Pentagon denied that Mattis participated in discussions about enhanced military action in Syria, adding that the talks never occurred. The United States condemns the ongoing military offensive that the Assad regime, backed by Russia and Iran, is perpetrating against the people of Eastern Ghouta…The civilized world must not tolerate the Assad regime’s continued use of chemical weapons. WaPo points out that, despite opposition to additional action against Assad seemingly stemming from the U.S. Department of Defense (DoD), the White House and the State Department appear to be more open to the move. Proponents of enhanced military operations argue that renewed action would deter Assad from using chemical weapons in a manner that may ultimately threaten the U.S. presence in the country. Soon after taking office, President Trump authorized airstrikes in April 2017 against a Syrian regime military base following reports that the dictator had once again used chemical weapons, an action that violates international norms. Images of Syrians suffering the impact of chemical exposure appear to have prompted the American commander-in-chief to take action, marking the first direct U.S. attack on the ruthless Assad regime, “a step that President Barack Obama had shied away from,” acknowledges WaPo. The Post suggests more recent chemical attacks at the hands of the Syrian madman Assad may again drive President Trump to target the regime. Assad has used chemical weapons throughout the war. The dictator employed the weapons, believed to be chlorine bombs, as early as February 25, when residents and medical staffers in the rebel-controlled Damascus suburb of Eastern Ghouta reportedly first described symptoms linked to the chemical. Assad regime troops reportedly killed one child during the attack. According to Reuters, the Organization for the Prohibition of Chemical Weapons is investigating whether the Assad regime used the banned chlorine chemical as a weapon in late February. 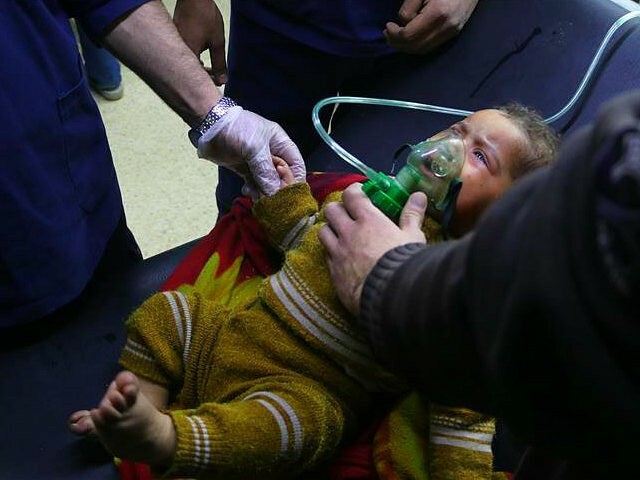 Citing the Syrian American Medical Society (SAMS), the Post notes that the chlorine attacks are less deadly, but the seven that have taken place so far this year have killed at least two people and wounded many others. Notwithstanding an internationally approved agreement to remove Assad’s stockpiles, several experts have recently acknowledged that Assad continues to use chemical weapons. Officials from Russia and their Syrian counterparts reportedly continue to reject evidence of Assad chemical weapons use. Assistance from Iran and Russia have allowed Assad to remain in power. The Syrian dictator considers all opposition forces to be terrorists. Currently, there are 2,000 American troops in Syria. Several ceasefire agreements have largely failed to bring the Syrian conflict, which has been raging since 2011, to a pause. The Pentagon has repeatedly stressed that the American mission in Syria solely consists of defeating the Islamic State (ISIS/ISIL). U.S. Gen. Joseph Votel, the top American commander in the Middle East, recently told lawmakers, ISIS has lost “more than 98 percent” of its so-called caliphate in Iraq and Syria. However, U.S. officials warned that the group remains a threat.